Two of India’s all-time great skippers Sourav Ganguly and MS Dhoni have brought umpteen laurels to the country. Ganguly was the one who instilled the much-needed aggression in the Indian squad and it was under his leadership that India began to prosper overseas. On the other hand, Dhoni led India to many memorable wins in various multi-team tournaments. He became the first captain in the world to win three different global ICC Trophies. Dhoni’s record in the IPL is also magnificent as he has won the trophy twice with his previous team Chennai Super Kings. However, both these masterminds failed to do well with a team from one particular city in India – Pune. They were unable to cast their magic spells when they led the Pune franchises and they came under huge criticism too. Though both teams are not the same and are not owned by the same company either, the connection with Pune is something in common. In 2012, the Ganguly-led Pune Warriors India finished at the bottom of the table with 8 points in 14 games. Meanwhile, the Dhoni-led Rising Pune Supergiants are currently languishing at the 7th spot in the points tally with 6 points in 11 games, and their chances of qualifying for the playoffs are over. Does this prove the adage, “A captain is as good as his team” true? We have tried to find out some interesting similarities between the two teams. 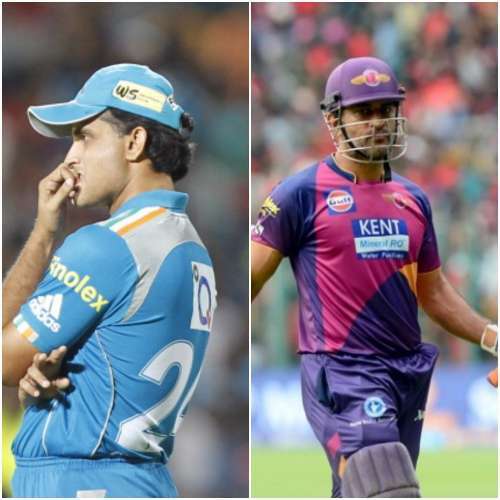 Here are the 5 interesting points of similarity between Sourav’s PWI and Dhoni’s RPS. In the 2012 edition, Ganguly was made the captain of the Pune Warriors side as Yuvraj Singh was declared unfit for the tournament. Ganguly, who retired from international cricket in 2008, looked a little out of sorts as he only managed to score 268 runs in 15 matches, putting up an average of 17.86. His strike rate of 98.89 was very low as per T20 standards and some of his decisions regarding the team selection also came under heavy scrutiny. The decisions to drop good performers like Jesse Ryder and Marlon Samuels in some of the games that season raised quite a few eyebrows in particular. This season, Dhoni too has received a lot of flak. His own performances with the bat haven't been up to the mark as he has failed to live up to his ‘best finisher’ tag this season. Though his average in the IPL 2016 is 30.28, he has been nowhere near his fluent best in the tournament so far. Also, some of his decisions have come under heavy scrutiny. He has not given the full quota of overs to his premier spinner Ravichandran Ashwin in several matches and that has received a lot of brickbats. Some of his bowling changes have also come under the scanner as his team has failed to defend targets.